Running is one of those activities that doesn’t require a lot of things besides a good pair of running shoes. A phone is one accessory that most of us want to take with us on the run. there are plenty of purposes to carry your smartphone. Safety: It’s a good idea to have a phone in your hands in case something goes wrong. Fitness apps: Strava, Runkeeper, MapMyRun, Nike+, and others can keep that data you want from your workouts – and even help you find your way should you get lost. Music and podcasts: For those who like music on the roads or trails, your smartphone comes in handy. Pictures: When you come across the scenery, you want to take a snapshot, because who doesn’t like to preserve memory? But what’s the best phone holder for running? As smartphones themselves are getting bigger, it’s becoming harder to bring them during a run. There are lots of gear and apparel available that address the need to carry a phone while running. As with most running gear, many products can help you. It’s a matter of preference which suits your workout habits. Some runners like to carry their phones in a running belt, while others prefer to keep them in their shorts, in an arm carrier, or a water bottle pouch. To keep your hands free while enjoying the benefits of a phone, you need to have the right phone holder. Hence, if you intend to bring your phone during your run, there are many things you need to take into consideration before making a purchase. With all the options that exist, you may feel overwhelmed. But not to worry – we’ve done the research for you. Check out this article of some of the best ways where you can stash your phone during a run. Holding a phone in your hand while you are running is a big no-no. 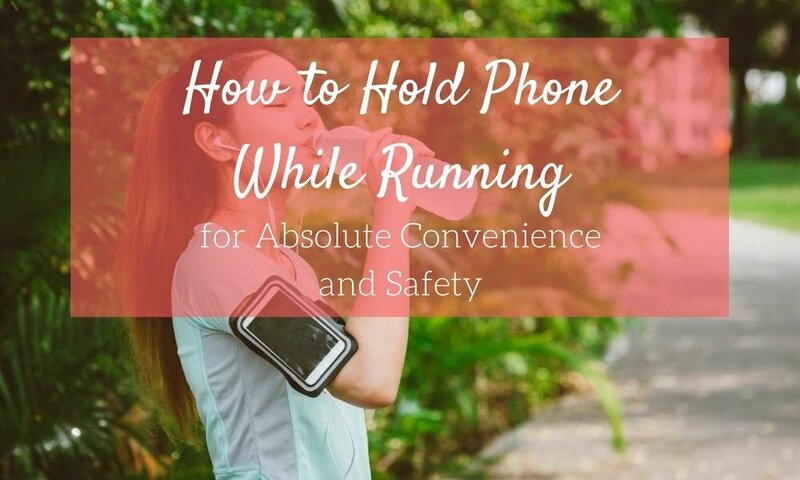 Not only is it unsafe for you while you run, but you also risk the possibility of your phone being thrown into the air, thanks to your sweaty fingers. So, what is the best solution to manage this juggling act between you and your phone? And here we take a closer look at these options. Armbands are the most common products out on the market to hold your phone around as you run. The material should be sweat proof and durable, and it should avoid any kind of chafing or slipping. If the cover is touch sensing, you need not to pull out your phone out when you want to access it. Good armbands will also work if you touch it through with your sweaty fingers. There should also be a slot that allows you to carry cash, cards or IDs. Reflectors help you stay safe during the night. Problem with armbands is that they are often too small for big phones with cases. And the big phone looks bulky on your arm. The big phone also means that armband bounces easily, and it needs constant adjustment, and you need to balance between loosening (slide) or tightening (restrain) it. And the large phone in your arm might alter how you move your arms. Running shorts, and workout clothes rarely come with safe pockets. Actually, it is quite hard to find running shorts with large zippered pockets to help you store your phone safely. Some of these are waterproof compression shorts. Well-fitted pockets give you a jostle-free movement. Running with a phone in your pocket may appear awkward to start, but over time you should get used to it. You notice how liberating it is to have nothing in your hands. So, you can run as fast as you can without the fear of your phone falling out and breaking into pieces. Do you remember those fanny packs (or bum bags) you used to wear as a kid? The running belt is vaguely similar to that, but it is a lot cooler. It excellently combines the armband and the backpack – a waist belt pack explicitly built for storage that holds phone snugly. You don’t have to risk of dropping your phone on the run and cracking the screen. And if you have a good fit, the bounce is minimal, and you need not adjust it constantly. It should sit comfortably on the waist and allows you to store small essentials along with you. A good quality running belt is waterproof and has big storage pockets. The whole purpose of a hydration belt is to hold the bottles of water for you and keep you hydrated while you run. There is a variety of options from 1-bottle belt to 4-bottle ones. If the belt has only one big bottle, it might appear bulky. With 4-bottle belt, weight distributes evenly. These hydration belts come along with one or several pouches that will allow you to store your phone along with other essentials. One downside that is that you cannot access your phone without taking it out from the pouch as the belt’s primary aim is to keep you hydrated. The upside is that the hydration belt has lots of storage space for your stuff. A hydration backpack is a specially designed backpack that carries a reservoir or “bladder” full of fluid. This bladder feeds a hose, which then leads over your shoulder and clips in place on the chest strap of the bag. Just by sucking the “bite valve” on the hose you can easily satisfy your thirst, but still keep your hands free helping you run. The primary purpose of hydration backpacks is to carry fluid, but they can carry cargo as well. The storage volume varies, but you can select size according to your needs. It will take time to adjust to running with a belt around your waist or something strapped to your back. But having the ability to carry dozens of ounces of liquid and other stuff you need holding nothing in your hands is a worthwhile investment. We can say with certainty that choosing any of these products to hold your phone for you while running will serve its purpose. Let’s have a closer look at these wrong places. You can always just carry your phone in your hand. But most runners don’t prefer this because it’s annoying, inconvenient, and awkward – especially if you’re trying to keep your hands relaxed. The downside is, if you fall, you can shatter your phone. It may not seem like a big deal, but holding your phone and water bottle while running can lead to poor running form. If you’re guilty of the hands-full habit, you may notice nothing initially. But over time issues can arise if you’re running regularly. If you move one arm differently than the other, it leads to one leg running differently. This affects your stride and adds additional stress to muscles. Running with something in your hand means that you use body parts differently than you usually would. So keep your arms relaxed, in a comfortable position, and allow your hands to loosen up. 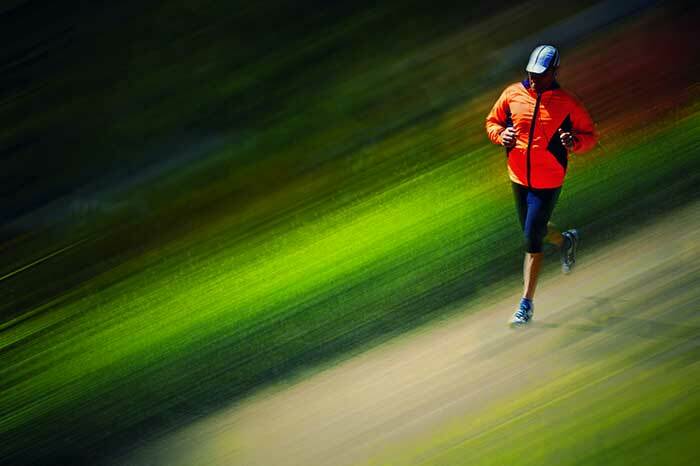 Swinging the arms clearly saves energy for runners, as this study says. If you genuinely want to go handheld, and you are not worried about balancing your arm movement, then you should look out for a hand-held water bottle with a phone case. Most women are guilty of doing this. A sports bra may appear to be ideal to put your phone in since you can easily access it and it is safe from the eyes of thefts. However, that’s a bad idea. For starters, the phone will get immersed deep into the cleavage as you pick up the pace. In worse cases, it can also possibly damage your phone as you will continuously sweat and it will go on your phone. To have your phone stay firmly in place, it is a tension and a size issue, so you need to get the sizing right. The whole purpose of compression socks is that it should squeeze the lower part of the leg, so you have an increased level of blood flow. Now, if you put your phone inside the compression sock, it will definitely hold it down in place. Unfortunately, since the socks are tight, the phone will leave an imprint on the skin that is already tender with all the running. Hopefully not! It is a known fact that when you run just a mile, you take about 2000 steps to do so. So, if you insert your phone inside your shoe or under your shoelaces, the chances of it getting crushed while you run are supremely high. The products we have listed for you are the best kinds of phone holders on the market and will ensure that you are comfortable and the phone is safe. Don’t compromise on the quality of these products as they are holding down the phone for you. The best gear is the kind you don’t have to think about while running because it’s comfortable and doing its job.